It has been some time ago that this journey happened, even before the first post on this travel diary and the first memorized journey to Calicut on that journey of forgetfulness of existence. The district two has amazed me as a child with its name starting with Q, even as Kollam would always be more appropriate. Quilon was that place with a first letter which would save me in “Name Place Animal Thing”, our traditional childhood game which competed with the WWF trump cards and later the Mario video games to keep its place in the hearts. That was my first official encounter with the place, when I studied about those fourteen districts of Kerala in a specific order, with Quilon coming second after Trivandrum. It was more interesting than learning about those planets which none of those people I knew had seen and proved to exist, and the names of those states of India which were a lot more than I could handle at that time, with no love for geography. But, our traditional childhood game did help, as I knew more places, and there was the need to know more places all around the world, and I guess it was the animal section that always gave me trouble. Quilandy came up to join Quilon at times to save the day, and Qatar made a late entrance. Being among the oldest sea ports and coastal towns on the Arabian coast of Kerala on the Ashtamudi Lake and having its own fame and popularity even during the times of the Chinese Civilization, Phoenician Empire and the Roman Republic, Kollam or Quilon has always had its own significance. It goes back to world of the Moroccan traveller and explorer, Ibn Battuta as it was one of those places of trade which he had visited during his long journeys of wonder and wanderings of significance. Even with the rise of Cochin, Calicut and Trivandrum as the three major cities of Kerala as taught to us during our childhood, Kollam was always in our list of places to visit as we grew up visiting places in the six districts, Ernakulam, Kottayam, Idukki, Alappuzha, Thrissur and Palakkad. There won’t be many people who would miss the place on their visit to the God’s Own Country, and all those who are on a road trip through the state of Kerala are surely going to stop here as much as any of the bigger cities. Along with trading with Chinese, Arabs and the other famed oriental civilizations, the knowledge of earlier trade with civilizations of Rome and Phoenicia would boost its historical significance even further and through that path of glory. Kollam is the fourth largest city of Kerala, after the capital city of Thiruvananthapuram, the commercial hub Ernakulam (Kochi), and the centre of North Kerala, Kozhikode on the basis of population, and the fifth with Thrissur added to the list on the basis of area. It was during the period of rule of the Chera dynasty in Kerala, that Kollam enjoyed the zenith of its power in histroy, and the place continues to be a major city and commercial centre in the Southern region of Kerala. The backwater tourism and the beauty of Ashtamudi Lake and the house boats add to continuously rising significance of the city as well as the district as a whole. There is no shortage of beauty with those long journeys through the lake, and there is no love lost in the procedure. There is the natural beauty being found and nothing being lost in this world. On the process, we would also be standing on the top of whatever existed throughout the history of Kerala, a rich heritage which had long roots right below us leading from a world which was superior during its age, and we see an existence which is the present leading to the future, that has its own additions to the same. The presence of the state of Tamil Nadu in the east, Alappuzha in the north, Pathanamthitta in the north-east and Thiruvananthapuram in the south has strategically placed the district in a position of significance. The ancient temple of Oachira is an important religious site, followed by the Kottarakkara Sree Mahaganapathi Temple and Ashram Sree Krishna Swamy Temple. Thomas the Apostle, who is said to have reached the Indian subcontinent in middle of the first century is said to have found Seven and Half Churches in Kerala and Tamil Nadu combined, also known by the masses as Ezharapallikal with one of them here; Kodungallur, Kollam, Niranam, Nilackal (Chayal), Kokkamangalam, Kottakkayal (Paravur), Palayoor (Chattukulangara) and Thiruvithamcode Arappally in Tamil Nadu which is known as the half-church. With connections of trade to Eurpe, Asia, Middle East and Ceylon, this would have been among the better places to establish such a house of God. It is one of the historical events in the history of Christianity in India. Amritapuri, not too far away from the city, is the main Ashram of Sri Mata Amritanandamayi Devi, the world renouned spiritual leader from Kerala. With its share of mosques too, the district remains a centre of spiritual and religious worship in more than one way. The first big structure we visited was the Holy Cross Church established in 1848, still retaining some of its antiquity. There was also a smaller church dedicated to Our Lady of Fatima. Pullichira Church was also among those churches visited, and its serene location added to the spirituality; as a great Marian pilgrim centre situated on the banks of Pullichira Lake. Martha Mariam Church of Thevalakara was also there for the visit. The Holy Family Church is another structure with its own beauty. I had to forget the names of the churches which I visited in the Kollam city, as the pages of my life turned at a high speed, and the same is the case of one of those beautiful temples which had such a peaceful atmosphere. The time does move incredibly fast, and this case is also not of any great wonder. There was that time when I visited and really enjoyed Kollam, but now it has faded away upto an extent with only those little memories which are left at some part of the soul, not easy to dig and find from under all which have managed to stay over it. It reminds us, how powerful are those bad memories and how weak are these good memories, and how much the latter hate us and try to get away from us as if there is a certain amount of hatred which is prevalent against us. The Palaruvi Falls would take the remaining time, even as there is not much about it that can be recollected from the disoriented memory now weakening. Thenmala is not to be forgotten even if not recollected at ease, and the beaches of Kollam always retain that charm. The trip to Quilon, or the train to the South as I had often called it, had a significant role to play at a time when I was hesitant to go out and wanted to stay indoor for most of the time. It was a time when the movie watching spree at the theatres hadn’t started yet, and no mall had infatuated me with its multiplexes. 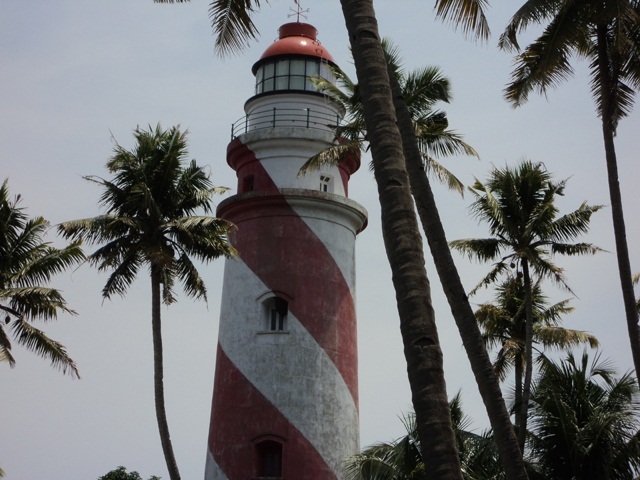 In that case, the beach town of Tangasseri‎ and its light house along with the fishing harbour created a powerful influence in totality there. Now, whateve remains of the St. Thomas Fort, stays there as a historical landmark, and the Infant Jesus Church as the spiritual side of that world. It was the most significant trip of that time, as there was not much of a journey which came before it, even as much bigger journeys were to follow. This journey was a stepping stone, a pathfinder to what was to follow, and therefore, there is not enough justice done to the place through this review from the memory. This is just a collection of what I could remember and what I could find. This is that dark day on which Reliance Netconnect blocked both wordpress (not the first time) and wikipedia with no notice or known reason, which means I have to find an alternate method to post this one.